It's under increasing reconsideration thanks to decreasing gas tax revenues. There are three lanes southbound (up the mountain) from the Ironto exit (128) to the Christiansburg exit (118) after a project several years ago that extended the lanes from the top of the first grade from Ironto all the way to Christiansburg. But wrecks on that side are fewer than the ones on the northbound/mainly downhill side. Since there are no exits between 118 and 128, once committed to continuing/getting on I-81 north in Christiansburg, you are pretty much stuck when something happens in that stretch. That is one of the most critical needs in the Salem district on I-81, adding that third lane. There is also an upgrade northbound just past the Ironto rest area that would benefit from an additional lane. That is one of the most critical needs in the Salem district on I-81, adding that third lane. At least between US-460 at Christiansburg and US-220 at Troutville. The plan for the I-81 Improvements include this section for three lanes, costing almost $1 billion. Would be built under the tolling plan. The entire 32 miles would be 3 lanes each way? I thought it was just a couple sections of roadway that would be widened to 3 lanes. There's a 3 mile gap in the widening just south of I-581, but from I-581 (Exit 143, MM 144) to Exit 150 it's back to six lanes. I feel like this "gap" is extremely useless, it will only cause congestion. But are all for widening in both directions? I would assume, it does not specify. Judging by the costs however, I would say yes. The "gap" (between I-581 and VA 419) already has an auxiliary lane planned for 2021. The widening could assume a third lane will be added in the median. Said lane would likely end at Exit 141 going north, with the left (new) lane merging right into the two existing lanes. A third lane would pickup at the ramp entrance on the other side on the right and extend to I-581, but it's not continuous for mainline traffic. Or, the "new" lane would become the exit lane at Exit 141 heading north, but again, still not continuous for mainline traffic even w/ the auxiliary. Or you could go to the project website and see exactly what they have planned. Isn't that what Sprjus4 detailed in his last two posts? ^ I don't think so. His post #80 suggests he was completely unaware of the Exit 141-143 auxiliary lane project until I mentioned it. His post #84 looks like a lot of theory about how the widening south of 141 would tie into the planned auxiliary lanes. Someone didn't think through this project. 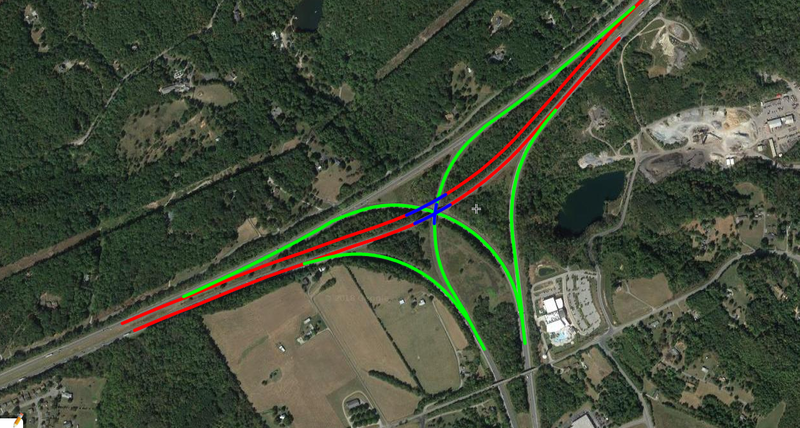 Per VDOT, "The southbound auxiliary lane will extend the exit 143 on ramp and become the new inside through lane. The existing outside through lane will become an exit only lane that will end at the exit 141 off-ramp." For reference, exit 141 is the VA 419 exit for Salem and exit 143 is the I-581 exit for Roanoke. The current configuration has I-581 traffic heading south on I-81 merging from the left. A number of years ago, this ramp was extended to make it easier to merge into the fast lane. If this lane is extended, then life is good for those coming off I-581, but traffic already on 81 will have to make a lane shift from the right through lane into what is now the left lane (and will be the right through lane when this is complete). Should someone want to go from 581 to get off on 419 (in either direction, there are two off ramps) he would have to cross the right through lane to get into the exit only lane. If there was more money, it would make more sense to shift the southbound through lanes to a new alignment closer to the northbound lanes (which would require a bridge over the 581 ramps) and make the ramps and former through lanes a C-D lane. Then extending the outside lane would make sense since 581 traffic could either merge from the right or continue to exit at 419. They really should go to 4 lanes each way between US-460 at Christiansburg and US-220 at Troutville, plus any needed interchange upgrades. Built for the future. This I-81 segment also carries overlaps of the traffic of two major cross-state arterial corridors, US-460 and US-220; not to mention the inter-regional traffic around Roanoke, Christiansburg and Blacksburg. To sum it up... this whole thing is going to be a mess. … like when you blow your groceries? This is pretty much the same thing that PennDOT did with I-81 between PA 114 (Exit 57) and PA 581(Exit 59). The WB on-ramp from PA 581 became the left lane for I-81 SB while the existing right lane now is an exit-only lane for PA 114. Wait, so is this going to become how I-295 merges with I-95 south of Richmond? The I-295 lane merges with I-95 on the left and becomes the southbound left thru lane. The right lane turns into an exit lane. I can see issues with this, it works better with I-95 / I-295 because an equal amount of thru traffic is coming from I-295 bypassing Richmond, with local / some thru traffic coming on I-95 from Richmond. That design goes back to the original plan where what is I-295 would have been a relocation of I-95. I-95 between downtown Petersburg and the new bypass, would have become I-795. I know, I'm just trying to get an example of what is planned for the I-81 / I-581 interchange, and this so happens to be one. It needs to have the left hand ramps relocated to right hand ramps. Agreed. They need to build a bridge over I-81 southbound to bring I-581 traffic in on the right, then turn that into an exit lane. The mainline should be 3 continuous lanes as well. I will leave it up to the engineers to finalize a design, but I would think that there should be no lane drops on I-81, all ramps are semi-directional and 2 lanes wide, and that long transitions would be utilized to transition the ramps into the mainlines. Probably will need more right-of-way. Here's a design I came up with. They could relocate a mile of I-81 Southbound and leave the existing ramps in place. This would allow for both the left exit and entrance to / from I-581 to be on the right instead. It would also stay in existing right of way. For lane configuration, the ramp from I-581 NB to I-81 SB has two lanes, and once meeting I-81 will lose a lane. That remaining lane would continue 2 miles to Exit 141 where it would finally exit. On I-81 NB, the ramp from Exit 141 would come on, continue two miles down, and exit onto I-581 SB. In this whole thing, mainline I-81 would also have 3 continuous lanes in each direction, with that 4th auxiliary lane between Exit 141 and I-581.